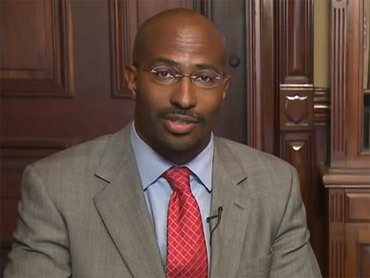 Van Jones took a bullet for his boss. After more than a week of withering criticism for past comments, Jones has resigned as an advisor to the White House on green jobs. The White House announced the news in the early hours of Sunday morning. In a statement, Nancy Sutley, Chair of the White House Council on Environmental Quality, thanked Jones "for his valuable contributions to the Council on Environmental Quality. Over the last six months he has been a strong voice for creating 21st century jobs that improve energy efficiency and utilize renewable resources. We appreciate his hard work and wish him the best moving forward." But Jones had turned into a political liability for President Obama after statements he made prior to joining the White House came to light. Last week Jones apologized for a six-year-old petition he signed, alleging government complicity in the terrorist attacks of Sept. 11, 2001. He also issued an apology for recorded comments from a February public meeting where Jones referred to Republicans as "a**holes" for not supporting administration efforts. On Saturday, Jones came under more fire after Verum Serum posted an excerpt for an anti-war CD that Jones appeared in which also featured Mumia Abu-Jamal, who was convicted of shooting to death a Philadelphia police officer in 1981. But that case has turned into an international cause celebre with critics arguing that Jamal's death row sentence should be overturned. Whether that was the proverbial straw remains unclear but as conservative criticism ratcheted up, the White House did not go out of its way to defend Jones. On Friday, press secretary Robert Gibbs responded to questions by declaring that Jones "continues to work for the administration." He referred all other questions about Jones to the environmental council. In a statement, Jones, who had worked at the White House as special advisor for green jobs since March, acknowledged that he had become a lightning rod for criticism. With the administration's hands full trying to push through controversial legislation on health care and energy, Jones said that opponents of reform had decided to launch "a vicious smear campaign" against him. "They are using lies and distortions to distract and divide," he said. "I have been inundated with calls -- from across the political spectrum -- urging me to 'stay and fight.' But I came here to fight for others, not for myself. I cannot in good conscience ask my colleagues to expend precious time and energy defending or explaining my past. We need all hands on deck, fighting for the future."